Regret and relief were present in equal amounts for both FC Augsburg and Borussia Mönchengladbach following their gripping 2-2 draw on Sunday. Download the exclusive free Bundesliga app here! 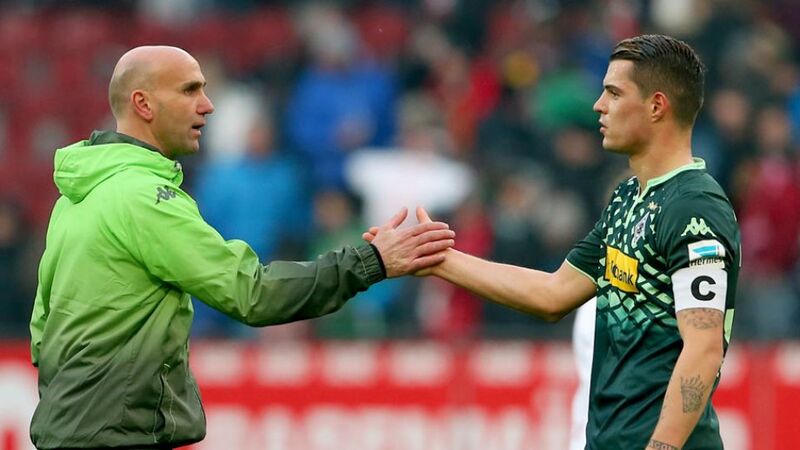 Granit Xhaka (Gladbach midfielder): "We really wanted to win the game. I think you could really see that at the start. We started well and carved out some very presentable opportunities, but Augsburg also had good chances, which is why it was such an entertaining game. We were too passive at the start of the second half, which resulted in us conceding the two goals. We shouldn’t be allowing that to happen, but we reacted brilliantly and could have won it with a bit more luck. Overall, I think both sides can live with the point." Havard Nordtveit (Gladbach midfielder): "It’s never easy in Augsburg, which is why we’re not completely unhappy with the point. We knew what to expect and Augsburg did a good job. They were particularly well-organised in defence. We weren’t quite at our best either in defence or going forward. Both teams gave chances away, so 2-2 is about the right result." Andre Schubert (Gladbach head coach): "We started well. We wanted to take charge of the game, but realised pretty quickly that Augsburg were defending well and hadn’t kept so many clean sheets this season for nothing. We had a lot of possession, but Augsburg kept things really tight in the middle. Still, we got in plenty of promising positions, but lacked the end product. At the same time, we gave too much away defensively, simply because we weren’t proactive enough. It’s a positive, though, that we hit back after conceding two quick goals." Paul Verhaegh (Augsburg defender): "You could say we threw two points away, but the draw is the right result overall, even though we were closer to winning it. We both had chances before the break, but Gladbach got in front. We went up a gear after the break and turned it around. With a bit more luck, we could have won it after Alfred Finnbogason hit the post in added time." Alfred Finnbogason (Augsburg striker): "It was a really important goal for me, personally. A striker will always be measured on his goals and it’s always particularly important for your self-confidence to score for your new team. It’s a shame I didn’t get a second. Sometimes victories are just millimetres away. Still, we can be really happy with our performance." Caiuby (Augsburg forward): "Overall, it was an even game, both teams played well and had chances. In the end, we’ve dropped two points, but with a bit more luck, we could have won it. It gives us confidence going forward, though." Markus Weinzierl (Augsburg head coach): "It was an action-packed Bundesliga game between two good sides. The lads put a lot into the game on Thursday [in the UEFA Europa League], but still deserved the point. We started well and had a few good chances that we really should have taken. Then we suddenly fell behind – it was our own doing. We reacted well, but unfortunately conceded a second too quickly. It was end-to-end late on, but neither side wanted to take too many risks. A draw is definitely the right result."